This week we are looking at the values that make us tick. Our values are what make us who we are and the greater awareness we have of these values (and the more effort we put into consciously living out these values), the more joy and fulfilment we will experience in life. We hope these exercises bring you greater awareness and help draw more joy into your life. This 'Values' coaching exercise has two parts. For the first part you need to print out the sheet below and read through all the values (click on the download button to access a PDF version). Read each word and give it time to ‘land’. See how that word feels, try it on for size. Does it make you uncomfortable or fill you with energy? 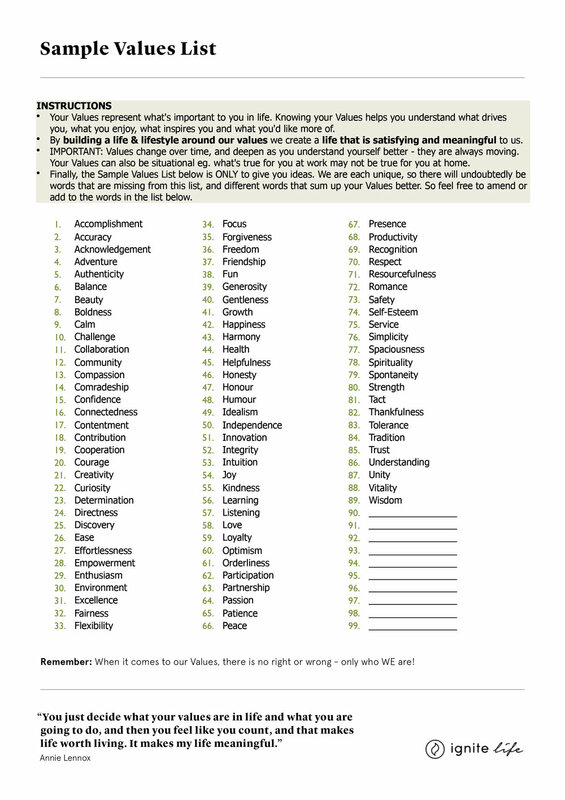 Circle the words that resonate most and add any other values to the list that you feel may be missing. The second part of the exercise involves referring back to your sub-personality sheet that you created on the retreat. Dig it out, and have a look at the sub-personalities you wrote down on the day. Try to allocate them within the values you circled or added to your list. Which values align with which specific personalities? Does one personality hold a certain type of value (e.g. adventure, curiosity, fun) and another personality hold a different set of values (e.g. accomplishment, productivity, resourcefulness)? Do any personalities share values? Are any values in perceived conflict with each other? How is this personality expressing these values at this current stage in your life? How would this personality react if someone tried to take this value away? For each personality rank the values that you have allocated it in level of importance. What activities, scenarios, people allow this personality to express certain values the most? Are there any personalities that are experiencing angst at the moment? If so are any of their values under threat? Eagle Arms Pose is a great one for relieving tight shoulders, dissolving tension in the neck, shoulders and base of the head as well as creating space in-between your shoulder blades. If you have any questions about it or can't feel the 'stretch' then do get in touch with Helen.